George L. Tirado is a Business Administrator that has worked on the Banking Business for over 27 years, he also manages his own tax office since 2008. He has been involved in the local Community providing counseling on HIV/AIDS prevention at the Miami Beach Community Health Center, Care Resource, and others International Institutions in different countries around the world. Also he had volunteer as a Director of a Healing and Buddhist Center, and as an Organizer at a Buddhist Center in Miami. George began his humanitarian travels in 2000 which inspired him to direct his energies to starting giving back something to the world. George has participated on HIV campaigns for Walgreen Pharmacies in the United States. He was given the ”Personality of the year 2015” award for his work on the Hispanic Community. He actively works on fundraising events such as the Aids Walk, Care Resource, Bodhifest Miami, Habitat for Humanity and many other organizations around the world. It was with his last travel around the Himalayas mountains early 2015, when he realized the need to help the children of a remote village in India. He was deeply moved by these children and has been working and committed himself to facing the challenges of those who need a hand, a voice and a face in the world. Juan Carlos is an Architect from Caracas, Venezuela, since 1989. He works at his own Construction Company in Miami Beach and works mainly in the construction of schools. 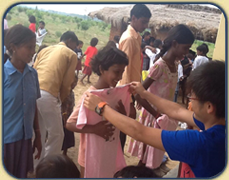 Juan Carlos was part of the group who traveled to India and Nepal in May 2015, where he assisted in the distribution of goods to the children around. His goal is to provide industry specific insides and administrative knowledge in support of the communities in need of development programs. Juan Carlos, with his extensive international travel, understands the importance and necessity to keep cultural heritages alive. He was humbled to come on board and be a part of the launch of the Indian project and the humanitarian plight for cultures facing extreme hardships around the world, and offers his time and talents to make a difference in the lives of others. Melissa while she is still a Student at the University in Miami Florida, she has been tireless traveling the world as an entrepreneur. She has always been ready to help and to take challenges for the benefit of a better world. Always worry for the less fortunate populations. She continues to believe in helping the disadvantaged and encouraging better health care, social, and political conditions for all members of the world community. Melissa always offered a help to all those in need. She has always had a humanitarian heart, and no matter what area of the world she is in, she is always looking for where she can lend a helping hand. George is the President at The MSA Group - Marketing Services of America. He has worked as Global Commercial Director at Harris Equipment, Marketing Director at Marketing Services of America, Novo Nordisk. This long extraordinary experience has giving him the opportunity to go around the world for over 20 years, he has always believe that a healthy economy, environment, and society are fundamental to the success of any Community. He hopes that the contributions he makes to those in need will inspire others to do the same, and result in not only a difference in the moment, but a change for a lifetime. He really enjoys being a valuable contributor, effectively developing and implementing his experience, his knowledge, his energies to feed and improve his spiritual life and the life of others. 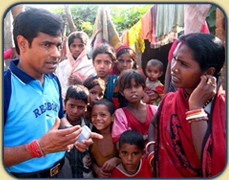 Siddhartha Kumar is co-founder and chairman of Niranjana Public Welfare Trust, which was established in 1998. Siddhartha himself has not received any formal higher education, and grew up surrounded by poverty. After having the opportunity to meet with Mother Theresa in 1993, Siddhartha was motivated and inspired to make a difference in the world. He decided to return to his hometown, and began to develop ideas and methods to combat poverty in his home region. This was the beginning of the Niranjana Public Welfare Trust. Since then, Siddhartha and NPWT have continued to work hard to break the cycle of poverty focusing on free, quality education and empowering people. Siddhartha has a dream that all children can live in a world free of poverty, where everyone has access to basic needs such as shelter, food, water, and quality education. I urge everyone to please help us to establish a school and orphanage in Ghonghariya. Linda Simon is a psychotherapist in private practice for more than 30 years. She is currently providing counseling for HIV/AIDS patients at a community health care center on Miami Beach, Fl. From 2002-2006 Linda was the Director of Psychosocial Services and Psychotherapist at a health care facility in Miami, Fl. Linda was instrumental in developing programs and workshops covering all aspects of HIV/AIDS. Past activities included Owner/Director of Center for Counseling Inc.and was responsible for marketing and conducting wellness programs for the community on various mental health issues and providing on-going psychotherapy. 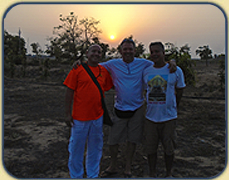 Linda began her humanitarian travels in 2005 which inspired her to direct her energies to starting FACES. In 2006 she participated in an HIV/AIDS woman's workshop in Uganda and raised money for sewing machines to help a co-op in Uganda to become economically self sustaining.